With my fascination in African catfish I have been trying to understand an interesting family of fishes, the Amphilidae and what an enigma it has become for me! They occur in leaf litter and forest edged rivers. Cool, clear fast running streams also contain members of this family. There are even many species that live solely over stretches of sand. One of these sand dwellers is now in Lake Malawi taking up house within shells. It is safe to say the diversity of the family is interesting but Amphiliidae also come with their own set of problems for aquarists. First being difficult to spot for collectors, then sensitive to ship and acclimate to the aquarium. Feeding the right foods is also challenging. There is also the difficulty of sorting to genus and species which brings us to why I like this months feature fish. Trachyglanis ineac is a distinctive fish among the Amphiliidae, yes, it is a small skinny fish like many of its congeners but along with having dark and light patterning which acts as camouflage among the leaf litter, sticks and plants of the rivers edge, it has an easily recognized spot pattern. There are two lateral rows of dark spots situated just above and parallel to the easily seen lateral line. The spots are on a brown to beige base coloration. Fins are also showing some darker brown markings over a translucent background. Another feature that can be used to differentiate is the shape of the hardened skull cap with a photo from above. The size of the fish up to 101 mm SL (4”) is of a medium to larger size when compared to some of the others within the family. There are currently four scientifically described species of Trachyglanis with the genus originated in 1902 by Boulenger. Trachyglanis ineac was originally described by Poll in 1952 as being in the genus Phractura but has since been moved to Trachyglanis. These fish have been known for quite some time but there may be other additions or changes to the genus as it seems like much study still needs to be done among the Amphiliidae as a whole. The care of the fish seems simple enough, clean water, some current but not too much to wash away any food given which they must have a chance to forage for. Many Congolese fishes living in the main channel are quite adaptable to water conditions, and my opinion is that stability is the key. Trachyglanis ineac is forthright when food is introduced and eats well. I have fed microworms, chopped bloodworms and frozen daphnia, in this case size is important, smaller rather than larger. You can see in T. ineac when they are eating well and will have a full bodied look. Like many of the family Trachglanis ineac prefers to rely on blending in as opposed to hiding and will seemingly sit out in the open but if attached to a rock or branch of a stick one must look closely to see them. Some leaf litter would also likely be a welcome addition that they could forage among. 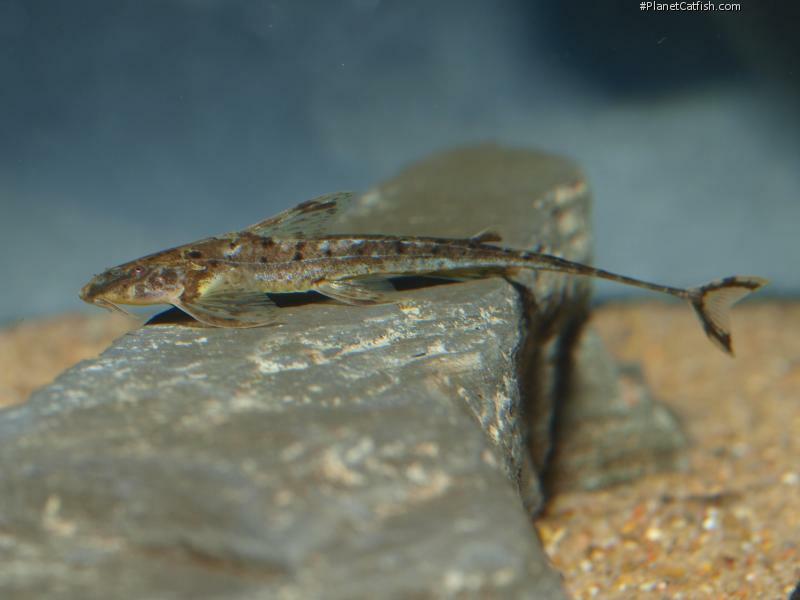 Aggressive tank mates would be a detriment and some of the small African barbs such as Barbus hulstaerti or the glass catfish Pareutropius mandevillei would be additions I would like to see once these fish have adapted to aquarium life. This is a challenging family of fish to keep and I am hoping over time there will be both more information from aquarists along with additional fish from collectors making this group of fish accessible to interested fish keepers. Etymology The Greek trachys meaning rough and glanis meaning a catfish. Size 101mm or 4" SL. Find near, nearer or same sized spp. References Annales du Musee du Congo (Ser. Zoology) v. 1, Fig 5.